In France it is usually drunk as an apéritif before a meal or snack. Originally the wine used was Bourgogne Aligoté, a lesser white wine of Burgundy. Nowadays, various white wines are used throughout France, according to the region and the whim of the barkeeper. Many prefer a white Chardonnay-based Burgundy, such as Chablis. Left: A bottle of crème de cassis, a bottle of white wine, and a glass of Kir. Originally called blanc-cassis, the drink is now named after Félix Kir (1876 - 1968), mayor of Dijon in Burgundy, who as a pioneer of the twinning movement in the aftermath of the Second World War popularized the drink by offering it at receptions to visiting delegations. Besides treating his international guests well, he was also promoting two vital economic products of the region. Kir initially allowed one of Dijon's producers of crème de cassis to use his name, but subsequently extended the right to their competitors as well. Following the commercial development of crème de cassis in 1841 the cocktail became a popular regional café drink, but has since become inextricably linked internationally with the name of Mayor Kir. When ordering a kir, waiters in France sometimes ask whether you want it made with crème de cassis (black currant), de mûre (blackberry) or de pèche (peach). The International Bartenders Association gives a recipe using 1/10 crème de cassis, but French sources typically specify more; 19th century recipes for blanc-cassis recommended 1/3 crème de cassis, and modern sources typically about 1/5. Replacing the crème de cassis with blackcurrant syrup is deprecated. Add the crème de cassis to the bottom of the glass, then top up with wine. 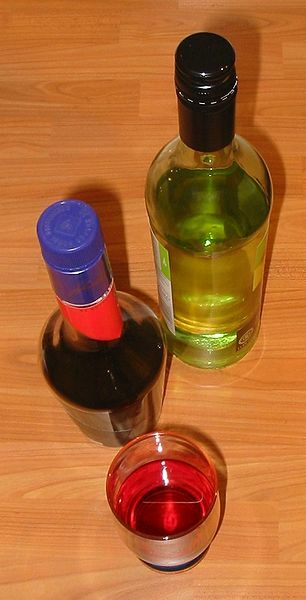 Serve in a wine glass (white). Cidre Royal - made with cider instead of wine, with a measure of calvados added. Hibiscus Royal - made with sparkling wine, peach liqueur, raspberry liqueur, and an edible hibiscus flower. Also noted with sparkling wine and pear schnaps. Kir Peche - made with peach liqueur. Pamplemousse - made with red grapefruit liqueur and sparkling white wine, which gives a slightly tart alternative. Tarantino - made with lager or light ale ("kir-beer").